Ever try to hold a life preserver underwater? It’s hard, isn’t it? 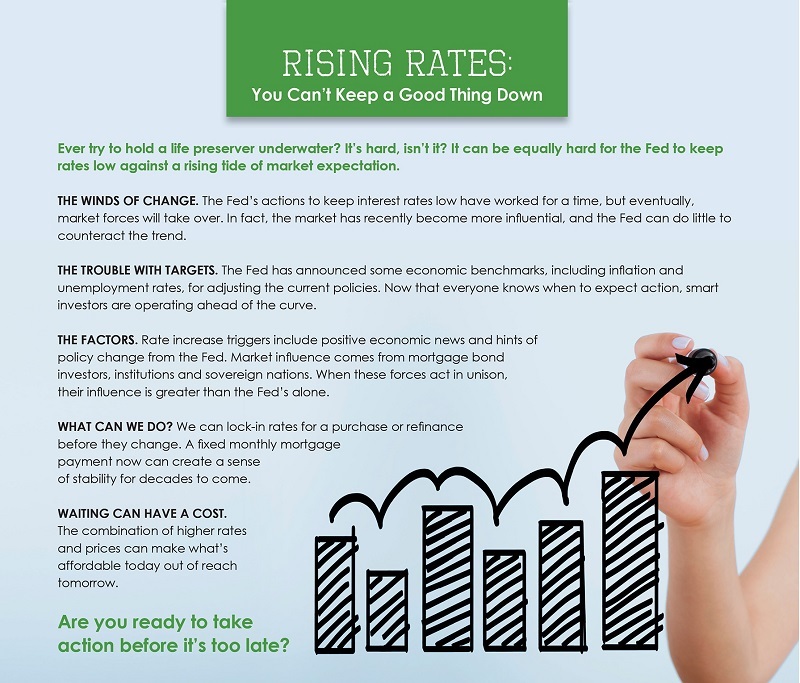 It can be equally hard for the Fed to keep Mortgage rates low against a rising tide of market expectation. The Winds of Change. The Fed’s actions to keep interest rates low have worked for a time, but eventually, market forces will take over. In fact, the market has recently become more influential, and the Fed can do little to counteract the trend. The Trouble with Targets. The Fed has announced some economic benchmarks, including inflation and unemployment rates, for adjusting the current policies. Now that everyone knows when to expect action, smart investors are operating ahead of the curve. The Factors. 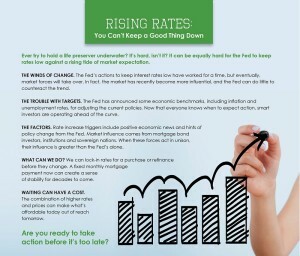 Rate increase triggers include positive economic news and hints of policy change from the Fed. Market influence comes from mortgage bond investors, institutions and sovereign nations. When these forces act in unison, their influence is greater than the Fed’s alone. What Can We Do? We can lock-in rates for a purchase or refinance before they change. A fixed monthly mortgage payment now can create a sense of stability for decades to come. Waiting Can Have a Cost. The combination of higher rates and prices can make what’s affordable today out of reach tomorrow. Are you ready to take action before it’s too late?